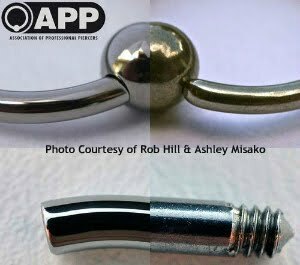 At Westcoast Piercing and Ink we carry only the highest quality Implant Grade fine body jewelry. The quality of the jewelry you are pierced with plays a large role in how your piercing heals. 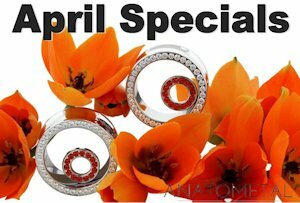 which includes Anatometal, Industrial Strength, LeRoi and BVLA. We carry over 250,000 combinations of jewelry! Doesn't your body deserve the BEST? We can get quite busy. Appointments for ALL services, including Custom Jewelry Design Consultations are recommended. 45 minute time slots are reserved per basic piercing and 1hr+ per advanced piercing. Please allow yourself enough time to fill out paperwork and discuss jewelry options. Being 15mins early for your appointment is advised. 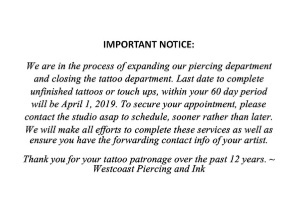 If you have any further questions or wish to book an appointment please call 604 584 BODY (2639) or email info@westcoastpiercing.com. We look forward to seeing you soon! Yes, we pierce babies ears! Appointments are mandatory and are booked by our availability. A $50 deposit is required at time of booking for all baby piercings and we require at least 24 hours notice for any cancellations. Deposit will be forfeited on all no shows. All appointments require a one hour time slot and may occasionally take longer. A physicians report supplied by us, to be filled out by your doctor prior to your appointment. For ease of healing, jewelry must be Implant Grade Titanium or Implant Grade 18K Gold. Come in on your birthday with your picture ID, and you'll receive a 50% off on any single piercing service. *Must be at least 13 years of age to qualify for Birthday Special. All branding services require a booked consultation and require an $100 deposit to book your procedure time. Cautery $150 minimum. Multi strike $200 minimum.